This table is made of durable heavy gauge steel. 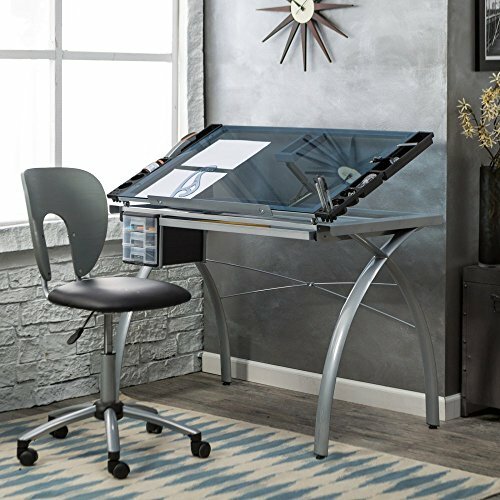 This sleek, contemporary-style craft/drafting table features a tempered blue safety glass work surface, which measures 38W x 24D inches. The surface tilts at an angle of up to 35 degrees for comfort while working. Additionally, it includes three plastic molded slide-out drawers ideal for storage, as well as a 28L x 9.5W-inch pencil drawer and a 24-inch slide-up pencil ledge that keeps tools from rolling away. Four floor levelers let you create a stable, even work surface, even on uneven flooring. This table measures 43W x 24D x 31.5H inches.